It’s the battle of the European mid-sized vans – both are white, both are diesel, both are manual and both are just under $40,000. They are the all-new Renault Trafic and the Ford Transit Custom, the latter of which won our mid-sized van comparison test in 2014. The old Trafic was impressive in that test, and ranked second even though that model was considerably more, shall we say, vintage than its rivals. Lots of people buy the Renault. 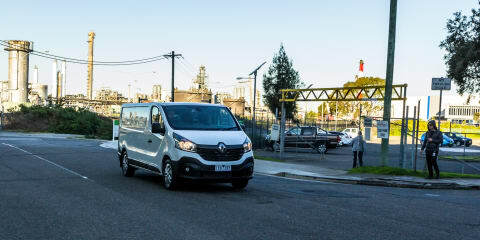 It has ranked as the top-selling van in Europe over the past few years, and while it hasn’t seen quite that level of success in Australia (it ranked third overall in 2014), the new model promises to find plenty more buyers. The Ford hasn’t yet found a big foothold in the local market after its launch last year, though it has overtaken the Renault so far in 2015 as the French van has been in runout ahead of this new-generation version hitting showrooms. The aim of this test, then, is to see whether the new-generation Renault Trafic, which came so close in our previous test, can better the very impressive Ford Transit Custom. 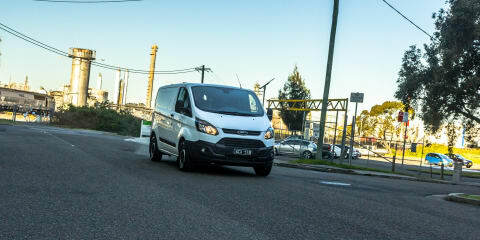 The Ford Transit Custom is priced from $37,490 plus on-road costs for the short-wheelbase (SWB) model, while the long-wheelbase (LWB) version attracts a $2000 premium. We had the SWB on this test. The Renault Trafic starts at a more attainable $33,490 plus on-road costs for its SWB version, which has a less punchy engine. You need to pay $36,990 for the twin-turbo SWB version, or $38,490 for the LWB model, which was the one we had on this test. The Renault we had on test was optioned with a number of items, too. They include the 7.0-inch touchscreen media system ($990) and 17-inch alloy wheels ($790). It does come standard however with two USB inputs, a single 12-volt charge point, a two speaker stereo system and a digital speedometer. The Ford has a regular analogue speedo. The Ford has one USB input but has three 12-volt points (two in the cockpit and one in the cargo area) and a four-speaker stereo, though there’s no option for a touchscreen media unit … yet. We’d expect the Sync 2 unit could arrive in the next couple of years. The Transit Custom has heated seats as standard, which is nice for early morning winter starts, where the Trafic has it as an optional extra for the driver – but you need to option extra airbag protection (more on that soon). Further, the Ford has standard pop-up roof-racks. The Renault has auto lights and wipers in this specification, where the Ford has neither. Both have Bluetooth phone and audio streaming, which worked almost flawlessly in the Ford but the Renault’s R-Link system seems to have a tendency to skip during audio playback, which we’ve noted in other cars of theirs, too. That said, the connection was easy enough to set up in both vans, and it reconnected quickly in both, too. For those who wish to use their vehicle as a mobile billboard (florists, bakers etc), there are plenty of colour options available for the Renault, including four flat colours which come at no cost (Bamboo Green, Laser Red, Storm Grey and Glacier White), and there’s a selection of six optional metallic colours (Oyster Grey, Jet Black, Mercury silver, Copper Brown, Panorama Blue, and Stone beige). These hues add a hefty $800. The Ford, though, has just two colours – Frozen White or Moondust Silver – the latter of which adds $385 to the price. Both of these vans come with the requisite stability and traction control systems, and both of the versions used here are load-sensitive, so they will behave differently if there’s a lot of weight in the back. Renault still asks buyers to pay extra cash for side/curtain airbag protection, at $490. Ford doesn’t – side and curtain airbag protection is standard for the Transit Custom. The Trafic claws back a few points, however, with the standard inclusion of a reverse-view camera (which is mounted high, near the tail-light, to give a great top-down view for parking) and rear parking sensors. Ford offers a City Pack that includes a reverse-view camera and front and rear parking sensors (it also includes an auto-dimming rear-view mirror, which is where the display for the camera is, and front fog lights). That pack costs $1500. We figure you’re likely to use the reverse camera and sensors more often than the airbags (if you option them!). If you subscribe to star ratings, the Ford is a better option as it scored five stars in EuroNCAP testing in 2012, where the Renault scored three stars against the tougher 2015 criteria. Both of these boxes on wheels come with a standard bulkhead between the cargo area and the occupant zone, although the base model Renault requires it to be optioned in. The glass in the Renault’s bulkhead is considerably better for seeing through – either to keep an eye on your load or the traffic behind you. The Ford’s mesh-covered window is much smaller, and the middle head restraint impedes the driver’s view. As for sizing these two up, there’s obviously a visible difference between the two, but as well as aligning fairly closely to the Transit Custom SWB on price, the Ford claims an almost identical load capacity – 5.95 cubic metres – to the Renault LWB model, which has 6.0m3 of capacity. (Note: that’s a VDA measure by Renault, and an SAE measure by Ford: in short, there’s more than 0.05m3 in it). The payload of the SWB Transit is 1032 kilograms, while the LWB model has 1360kg of capacity. The Renault has 1237kg of payload in SWB guise with this engine, while the LWB has a 1274kg payload. The Renault Trafic L2H1 spans a not-inconsiderable 5399mm in length. The shorter-wheelbase version measures 4999mm long. The Ford Transit Custom SWB we tested is shorter than either version of the Renault, spanning 4972mm, though you can get a longer-body version that stretches 5339mm. The load space of the Ford measures 2555mm long (plus a further 530mm through a small trap door in the bulkhead), 1775mm wide (and 1390mm between the wheel-arches) and 1406mm high. The Renault’s load space measures 2937mm long (or up to 4150mm using its trap door), 1662mm wide (and 1268mm between the arches) and 1387mm high. So, the Ford has a slightly better space, if a little shorter, but the fact you can load a length of steel, or pipe, or a ladder, or a plank or anything else up to 4150mm in length means the Renault has a certain level of appeal. As for loading in and out, both come with a single side kerbside sliding door. The Renault’s side opening measures 907mm wide, where the Ford’s is 1030mm. The Renault, unlike the Ford, can be optioned with a pair of sliding doors, and you can have them glazed ($990) or solid ($690). The Ford, however, has standard barn doors at the rear, where they’re optional on the Renault ($190), and in both instances they open up to 270 degrees. The opening of the Renault’s rear port is 1391mm wide by 1320mm tall, where the Ford’s is 1400mm wide by 1340mm tall. The Renault’s rear door mechanism is better to use regularly because it’s a simple lever, unlike the Ford’s version that has ungainly handles that eat into space. The doors on the Ford, however, are lighter than those on the Renault. The Ford has a standard plywood lining and non-slip floor mats, but you have to pay $990 for those in the Trafic. In terms of securing your load, the Renault has 18 tie-down points mounted on the floor and walls of the van, where the Ford has just eight. Up front, they both feel considerably more car-like than most of their contemporaries. The Ford has a smaller steering wheel with a vast array of buttons on it that could be a little daunting, but it’s mirrored by a dashboard menu system that also goes heavy on the buttons. The Renault has a bigger steering wheel that is simpler to look at, but it has confusing cruise control buttons (some on the dash and some on the wheel), and a stalk for audio controls that comes off the column rather than traditional buttons on the wheel itself. The standard Renault dash is simple with not too many buttons to overwhelm the senses, but with the touchscreen media system optioned it is a considerably cleaner and classier looking cockpit. In terms of access, Ford requires a bit more of a step up and stretch down from the cabin, where the Renault is slightly easier to swivel out of when you need to hit the ground – though the twisting movement is probably bad for your back in either case. In terms of seat comfort, both are excellent for the driver, and both offer good adjustment to make the seat comfortable for different shaped drivers, too. The bench seats are equally compromised, as well. The Ford’s two-seat bench feels like it would be fine for shorter stints, where the Renault’s has a little bit more comfort, though the gear-shifter does eat in to knee space in the French van. The Ford, though, has a shifter that’s placed further away from the driver. As well as the shifter being a bit of a stretch, the ventilation controls are a bit of a pain to get to in the Ford. The Renault’s are closer and easier to see at a glance, too. As for doubling as a mobile office, the Renault has the points here. It has a fold-down middle seat that doubles as a bench for those who work on the road, and there is an optional clipboard holder and laptop stowage behind the middle seat. Storage across the dashboards of both vans is excellent – but the Renault is better. It has a dash-top folder holder, as well as that clever bit between the seats. Both have dash-top cup holders, and there are big door pockets for both as well. As we said at the outset, both of these front-wheel drive vans come only with turbo diesel engines, and both are only available with six-speed manual gearboxes. Ford has told us in the past that an auto is on its way, but there’s no developments on that front; Renault isn’t doing an auto for the Trafic because it estimates less than 10 per cent of buyers would want it worldwide, though the local figure is closer to 50 per cent. There’s a bit of a size difference under the bonnets, too. The Renault is powered by a 1.6-litre twin-turbocharged four-cylinder diesel engine producing 103kW at 3500rpm and 340Nm at 1500rpm. It has engine stop-start, a fuel-saving Eco mode and brake energy recuperation. The Blue Oval van has a larger 2.2-litre four-cylinder single-turbo diesel engine producing 92kW at 3500rpm and 350Nm between 1450-2000rpm. So, despite having an engine that’s 600cc larger, it has less power and just 10Nm more torque. It doesn’t have stop-start nor does it have an Eco mode. That said, Ford claims fuel use of just 7.1 litres per 100 kilometres for the Transit Custom SWB (7.3L/100km for the LWB), and, unsurprisingly, Renault claims a lower consumption average – 6.2L/100km. That said, on our test we saw a much closer race between these two – the Renault used 8.1L/100km and the Ford used 8.0L/100km, however the Ford had a better run in traffic. Despite the fact the Renault has a much smaller engine, it never feels underpowered, even with a load on board. And we had one of those – a pallet with about 800 kilograms of tiles on a crate pallet loaded over the back axle. The engine is refined, quiet and brilliant in terms of the way it pulls from low revs, and the manual gearbox is smooth enough for day-to-day duties. And if you’re in traffic, the stop-start system is smooth and quick to fire. The Ford’s engine doesn’t feel as willing initially as the Renault, with some notable lag down low in the rev range. That said, it has more pull than the Renault in the mid-range, but it is noisier at start up and during running around town. Its six-speed manual gearbox has a smoother shift action than the Renault, but the awkward shifter position could annoy some drivers. If you spend a lot of time on the road, this could be the category that makes or breaks a potential new van for you. Both of these two models are extremely good to drive – better than the majority of the rivals in the class, such as the iLoad, HiAce and Vito (though that model is due to be replaced soon). The Ford’s suspension is softer whether the van is empty or full, which could be a plus if you spend a lot of time on pockmarked back streets, but the bouncy nature can also be a little grating on the highway, and over speed humps with a load on board where it takes a lot longer to settle down than the Renault. Indeed, the Trafic’s ride is considerably more amenable to disposing of inconsistencies on the road without fuss, even with a heavy load on board. It settles fast after you hit a bump, and never bucks or wallows. The Renault’s turning circle is poor in comparison: its kerb to kerb turning circle is 11.8m for the SWB model and, as expected, the extra space between the front and rear axles exacerbates the issue further, and in LWB guise it is 13.1m. The Transit’s engine sound does intrude in to the cabin more, and it was a touch louder when we tested the two in an identical highway scenario (there was two decibels in it). The steering is considerably sharper and quicker to react in the Ford, which is excellent for urban running. The Renault’s steering is also very well sorted, but requires a touch more effort when parking or turning at intersections. The Renault takes the top spot in this test when it comes to drivers who will cover lots of kilometres every year. The French brand requires services every 12 months or 30,000km, where Ford asks for maintenance to be performed every 12 months or 15,000km. So, businesses could be without a van for two days a year rather than one, and the costs for the Ford are notably higher, too. If you cover an average of 30,000km per year – as most couriers or van drivers do – you’ll spend an annual average of $705 on the Ford, but just $349 per year on the Renault. That said, Renault has a disclaimer on its site that states the Trafic is “subject to adaptive servicing requirements, as determined by the Oil Condition Sensor, and may require servicing prior to the standard 12 months or 30,000km service interval”. As for warranty coverage, the Renault is again the better bet as it has a three-year/200,000km warranty. The Ford has a three-year/100,000km warranty, but you can option it up to higher mileage or duration. The Renault also has a longer roadside assist program – three years, as opposed to one year for the Ford as standard. This was always going to be a close call, and while these two vans are slightly mismatched on size, they both perform their duties with admirable levels of integrity. If you have to do a lot of driving around town with hardly anything in the back, the Ford would remain the better option. Its sweet powertrain and terrific turning circle mean it feels at home in the city. But if you do a bit more distance with more weight in the back, the Renault could prove more tempting. It never feels stressed and its strong low-rev torque makes it a great cruiser. Which van wins the battle? That really depends where the war is being fought. Click the Photos tab above for more images by Christian Barbeitos. Thanks to Power Docs and Freight (www.powerfreight.com.au) for allowing us to play courier for a day.